How many of us went out during pregnancy and spent an absolute fortune then days after baby arrived were wondering how on earth we didn’t have in our hands the most basic of things? Just me? Here I’ve compiled a list of the 10 newborn essentials we used in the first few months of both Dexter’s and Felix’s lives. These fabulous inventions give us so much peace of mind. They are basically zip up sacks that you can get in a range of togs. You place baby within them and he is nice and cosy warm without the need for blankets. It saves you the worry that baby is going to kick off the blanket and get cold or worse still, kick it over his head and put himself at risk for SIDS. Dex was born in the summer so we used 0.5 tog sleep sacks from Mothercare to start with before moving onto this gorgeous Antipodes Merino wool sleepsack. Felix was born in the winter so sleepsacks were an absolute must to keep him warm and cosy. We started with the ergoPouch Swaddle and moved into Grobags later. 2. 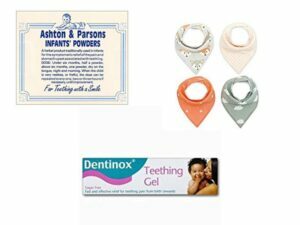 Teething essentials – powder, gel, dribble bibs. It comes out of the blue, one day baby is content, without a care in the world, the next he is screaming the house down and nothing will pacify him. It can only mean one thing: teething. Luckily we were more than prepared. I advise you to get the stuff in even before baby is born because although most babies tend to teethe at 4 months+ some start much earlier. We use Ashton & Parson‘s powder day and night. I don’t know how it works, but trust me, it’s a godsend. We top up with teething gel throughout the day and during the night when he wakes. We’ve used both Dentinox and Bonjela which have been great. As for dribble bibs, I bought 100s to make sure I had one for each outfit. Little did I know that I would be changing them five times a day. When they start teething they dribble and drool like never before! At least it gives me an opportunity to go and buy some more! Easy to administer, tastes great (although Dexter always pulls a face as if I am trying to poison him when I give it to him) and works almost immediately. Again, make sure you always have a bottle handy, it works wonders to ease the pain of teething plus you never know when baby might start with a fever. It also needs to be administered after the first and third vaccinations. The bottle comes with a syringe so you can sneak it in baby’s mouth, usually after the first taste they are happy to have more. Dexter, not so much! When baby is first born his eyes are so sleepy it’s unreal. No, I don’t mean he’s tired all the time (although he is that too! ), I mean there’s mucous coming out of his tear ducts and it seems to never end. I honestly thought Dexter had an eye infection until the Health Visitor explained it was normal. The best thing you can do it dip a cotton wool ball in cooled boiled water and wipe the eye clean. Then repeat with a dry ball. It clears up after a few weeks when the tear ducts open up. We must have gone through ten bags of these, they’re also super handy to use to clean baby’s ears and neck. Babies are born with long scratchy nails which you can’t cut because they are still attached to the skin. It is recommended to leave it for a few weeks before doing anything. Meanwhile you dress your newborn with scratch mitts which they promptly take off at every given opportunity and end up clawing at their faces leaving a multitude of scratch marks. Sleepsuits with built in mitts are fab because it’s so much more difficult for baby to escape from them (although still possible!) Babies have this tendency to claw at their faces when they are hungry so I always try to make sure I cover up their hands while I quickly make the bottle. These are super handy for wrapping baby up, clearing up any milk spillages/sick or using as a comfort blanket as baby gets older. You can get a whole range of patterns and I bought mine off eBay from China for £3 a piece. They are soft and beautifully designed. Dexter takes one with him wherever he goes. Not only do babies have mucousy eyes but they have a lot in their noses and chests for the first few weeks. A handy bit of advice is to take them in the bathroom with you while you shower so the steam can clear out their lungs (but who has time to shower with a newborn to look after amiright?) The alternative is this amazing stuff called Snufflebabe. The drops by the way are useless…I ended up squirting half a bottle up Dexter’s nose but the spray is fantastic. Two squirts up each nostril and baby sneezes most of the stuff out. Whatever’s left can be sucked out with a nasal aspirator. I have found it really tricky to use this and it would be nigh on impossible without the snufflebabe to help me. If you are going to bottle feed you could buy those premade cartons of formula to use while out and about but I found them expensive, wasteful and Dex started to hate the taste of them. When they are tiny they only need a small amount from the carton and the rest then gets chucked away which can be an expensive way to do it. By carrying around a flask and little pots with the formula already measured out, you can make the food on the go. I always try and make the bottle up around an hour before he is going to need it so it has sufficient time to cool down. Not always easy with a newborn who isn’t yet in a routine but who really wants to be out and about for hours on end when you’ve just had a baby anyway? I use Tommee Tippee milk powder dispensers which cost only £3.59 for a pack of 6 from Amazon. You can buy them here. Vests are just so handy for using to layer your baby up in warm clothing. Dexter always has a vest on under his outfit. I wish I’d been given and bought more of these instead of wasting money on newborn outfits he was never going to wear. When they are tiny you just want them in soft, comfortable clothes that are easy to take off if they’re sick or have a poo explosion. We were gifted a gorgeous Mickey Mouse comforter and it now never leaves Dex’s side. I began using it at bedtime as a sleep tool but now he comes everywhere with us incase Dex has a little meltdown. When baby gets upset and cries and you are comforting them with cuddles/milk/food, you also get out the comforter. They then learn to associate being comforted with their comforter so if they get upset during the day or at night you have this handy tool to help ease their tears.